Are you looking for a quick and easy way to record lectures or capture content from your screen? Camtasia and Snagit make it easy for anyone to create great videos without having to be a video pro. Easily record your on-screen activity or web camera then customize, edit, and share your videos with viewers on nearly any device. Click Here for instructions on how to download on your campus supported computer. Camtasia allows you to record your screen and webcam separately, or at the same time, then edit it by adding additional images, video, music and text. It is easy to use whether you looking to create simple video lectures, or more advanced interactive videos with click-able links, tables of contents, search, and more. It allows you to edit out mistakes and create a video you can upload to Bb Learn, YouTube, or another website of your choice. 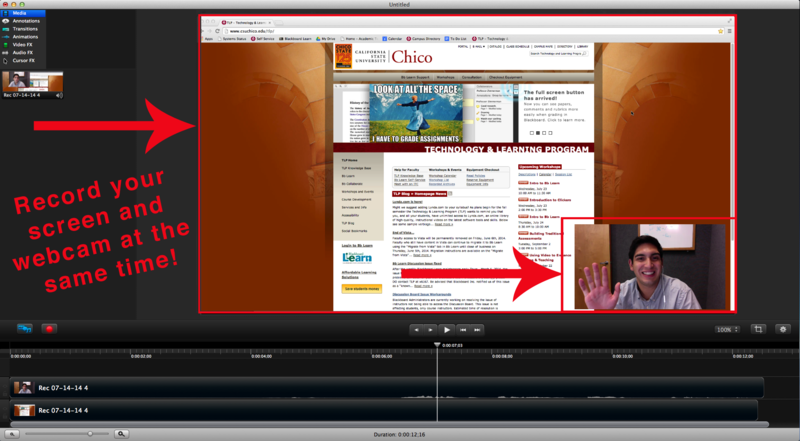 Click Here to view the Knowledge Base on Camtasia complete with tips, tricks, tutorials, and more. If you are only looking to capture screen content, Snagit is a great easy-to-use tool. You can capture anything you see on your screen and then save and share it with your viewers on any device. It allows for video or still image capture, and is very user friendly. Snagit comes stocked with customizable arrows, bubbles and notes to customize and mark up your screen captures. Click Here for instructions on how to download to your campus supported computer.